If you love Reese’s you’re going to LOVE my No Bake Reese’s Peanut Butter Bars. 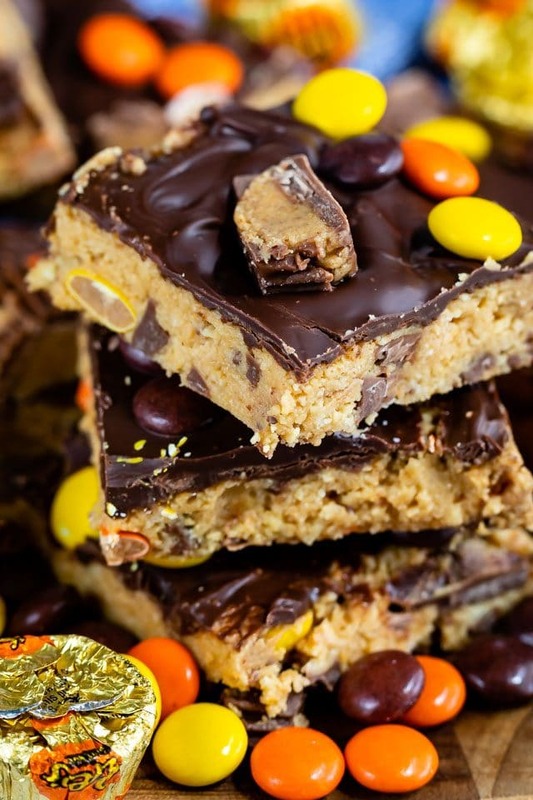 These peanut butter bars have Reese’s Pieces AND peanut butter cups inside! Ah, peanut butter bars. Is there any better dessert? I think not. I’ve made several versions of these bars: with graham crackers, with pretzels, even with Oreos inside! 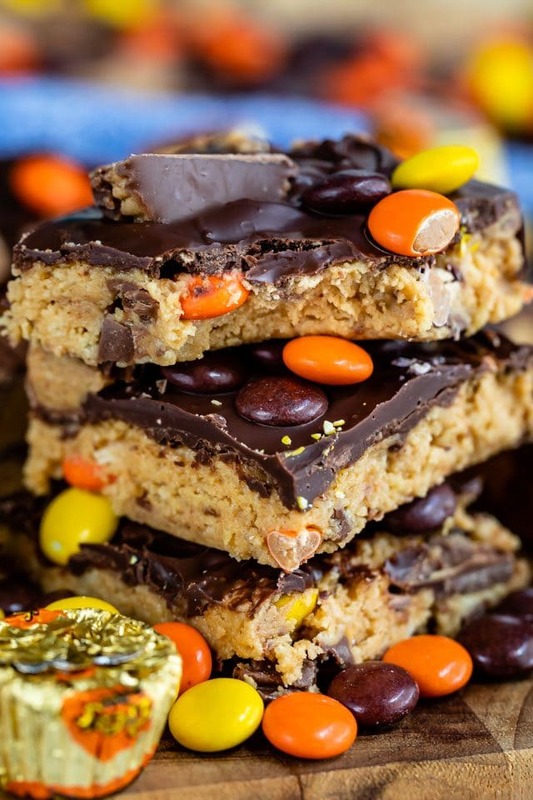 There are so many variations for this recipe and this time I’ve outdone myself: they’re no-bake peanut butter bars made with Ritz Crackers and FILLED with Reese’s Pieces and peanut butter cups. I’m gonna go out on a limb and say you won’t be able to eat just one of these. You’d think they’d be too rich to binge eat but they’re not. They go down fast and easy, lol! These easy no-bake peanut butter bars taste like a Reese’s Peanut Butter Cup. They’re pure heaven! 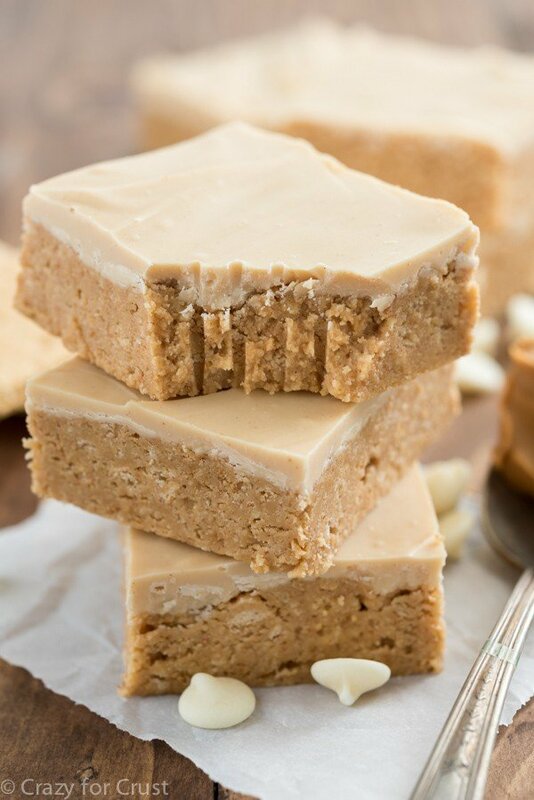 I’m sure you’ve seen peanut butter bars all over Pinterest. You may even have seen (or made) my recipe for the BEST Peanut Butter Bars. This is similar to that recipe except I added alllll the Reese’s inside. 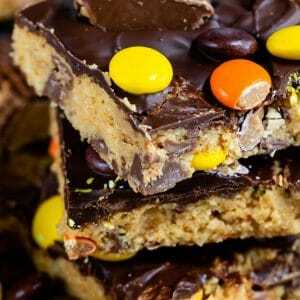 How do you make no-bake peanut butter bars? When it comes to the crackers, I’ve used lots of different kinds, namely pretzels, Ritz, and graham crackers. My favorite way to make no-bake peanut butter bars is without graham crackers: I love using Ritz Crackers most! They’re salty and crunchy and add a great texture to the bars. You can make these bars with just a bowl and wooden spoon, or you can use a hand mixer. They come together in just a few minutes and just need a little while to chill so they set. There are so many ways you can vary this recipe (like adding marshmallows and making them s’more) but this is obviously my favorite. More peanut butter is always better! I made these bars in a 9×13-inch pan for a thinner bar because I wanted to serve several people. Plus, they are rich and full of lots of calories so a smaller bar is better. However, if you want thick bars, make them in a 9×9-inch pan. If you don’t want to use Reese’s Pieces or Peanut Butter Cups you could skip one or the other, or use M&Ms instead! I prefer using creamy peanut butter for these. Make sure to crush your crackers very fine. I use a rolling pin and ziplock bag. Chill them to set but let them sit out for a little bit before slicing, otherwise your chocolate will crack. They get soft if they’re out of the refrigerator for more than a few hours, so store them in the fridge. These last several days in the fridge if they’re in an airtight container. 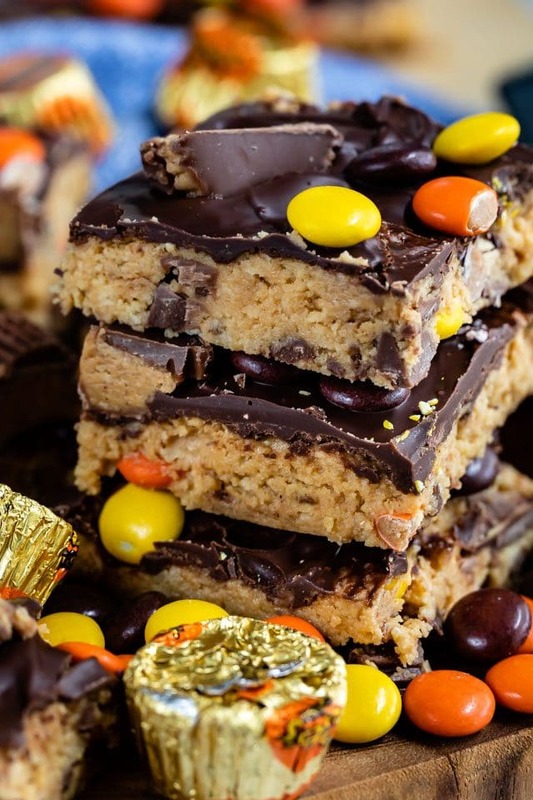 NO BAKE Reese's Peanut Butter Bars taste just like a peanut butter cup and are filled with Reese's candy! This easy no bake bar recipe is the perfect peanut butter and chocolate dessert. Stir melted butter, cracker crumbs, 3/4 cup peanut butter, and powdered sugar in a large bowl until smooth. Mixture will be thick. Stir in chopped peanut butter cups and Reese’s Pieces. Press into prepared pan. Melt chocolate chips with remaining 2 tablespoons peanut butter. Heat on high for 30 second increments, stirring between each, until melted and smooth. Spread over the top of the bars. If desired, sprinkle with additional peanut butter cups and/or Reese’s Pieces. Chill the bars to let them set, then slice into squares. 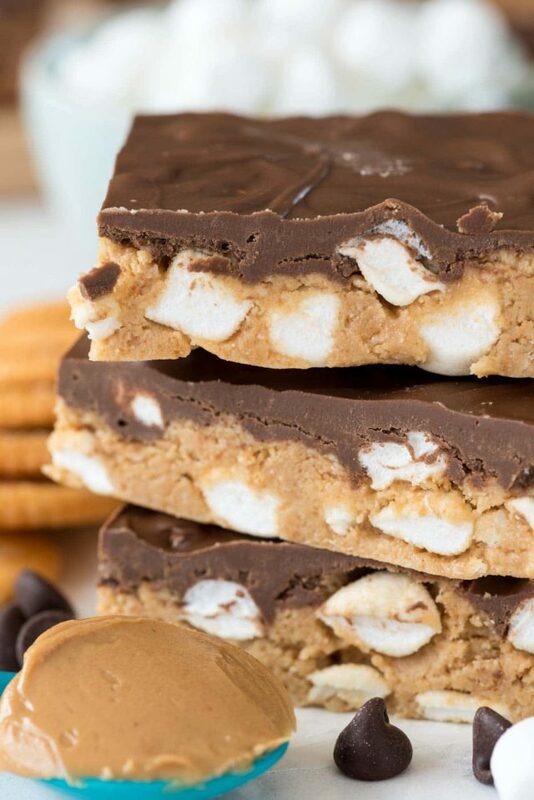 S’mores No Bake Peanut Butter Bars are another favorite! Love Reese’s? 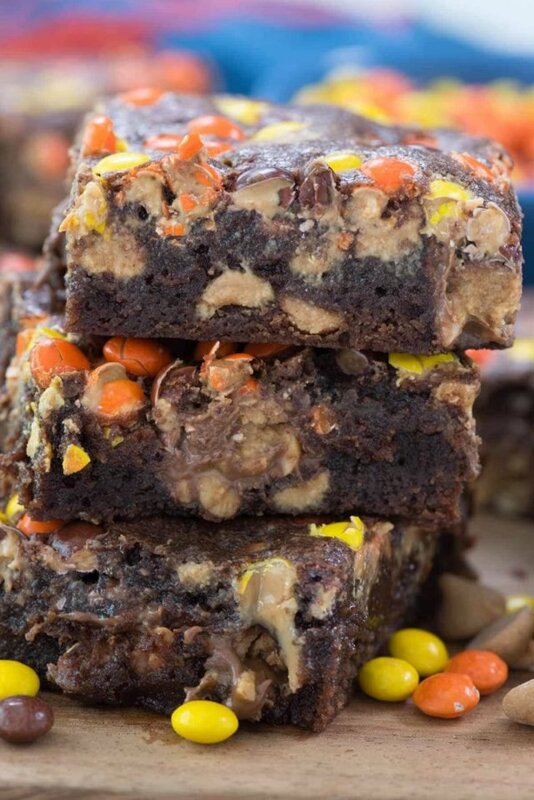 Try my ULTIMATE Reese’s Brownies! Double Peanut Butter Bars have a peanut butter topping! Haven’t made these yet but certainly will. Question tho. How many chocolate chips? I am guessing about half a bag? ?